Marie Raichvarg, Partech Shaker: How did you initiate your business relationships ? Elsa Duperray, WINGiT: Working in the Shaker has been an accelerator and has helped building up this great operation. Surely being at the Partech Shaker helps trust the start up you team up with. We're working on the 3rd Floor, HotelTonight on the 5th, and evolving in this start up energy is incredibly motivating. But we also worked together 2 years ago in London, when WINGiT launched in the UK and when Marie was still working there. Both our companies have grown up since then and we were happy to meet again here, rue du Mail :). Marie Hardel, HotelTonight: Exactly! Being in the same building really helped us in getting to know WINGiT's team and working closely together in a very efficient way. Marie Raichvarg, Partech Shaker: Elsa, what brought you to work with HotelTonight on a cross-communication partnership ? Elsa Duperray, WINGiT: HotelTonight's strategy and concept is based on spontaneity, just like us. WINGiT means to improvise, to get inspired, be spontaneous. I am myself a HotelTonight user and it offers "inspiration", just like WINGiT. The idea is to tell people to stress less and improvise more, to tell them: "Find a cool event in WINGiT and spend the night at a cool hotel". The fact that HotelTonight is in the Partech Shaker is a proof of seriousness. Marie Raichvarg, Partech Shaker: Marie, on your side, why was WINGiT a relevant partner for HotelTonight? Marie Hardel, HotelTonight: At HotelTonight, our mission is to enable people to take advantage of the serendipity of life. We make discovering, booking and enjoying a place to stay at the last minute fun, simple and accessible. We believe we could all spend more time experiencing the world around us and less time trying to plan! Because they help users find cool events shared by insiders, WINGiT's mission is close to ours. 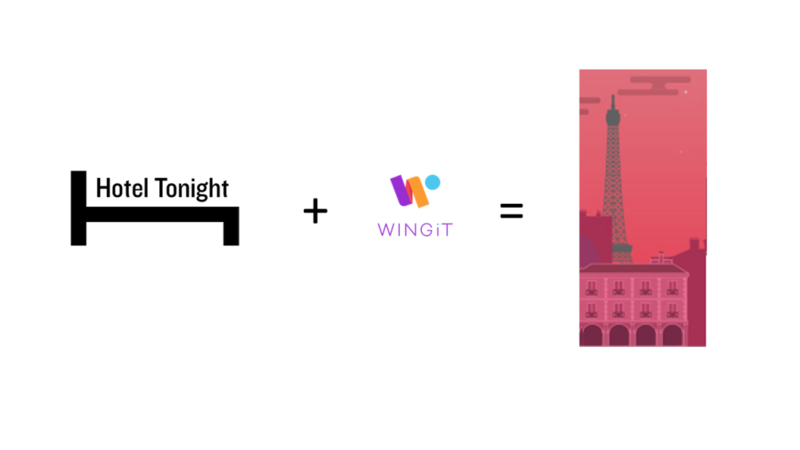 At HotelTonight, we are also excited about sharing with our audience the latest apps, restaurants, and trends, and that is why we wanted to do a partnership with WINGiT. Marie Raichvarg, Partech Shaker: Would you like to partner with any other startup working from the Shaker? Elsa Duperray, WINGiT: Sure ! We can always learn and gain experience from other start ups. If our service can be additional and offer something more to our user, then let's go. The user experience comes first. Marie Hardel, HotelTonight: Of course. We have constant conversations with other startups working from the Shaker! We opened our Paris office just a year ago and it has been amazing to be in the center of Silicon Sentier and so close to other startups, as we share similar challenges and ambitions.